This colorful finishing touch for your letters and packages will remind you of a tasty cherry soda pop! It's a refreshing way to give your outgoing mail some color and character - especially if you've got a bubbly personality! However, the sweetest part about your new labels is how quick and easy they make a tedious task. Filling out envelopes will be a snap thanks to the self-adhesive backing. Just stick them on anything you send out in the mail! 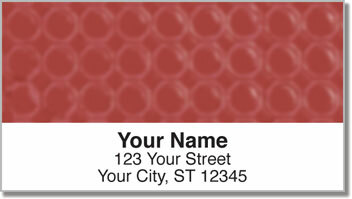 Get your very own Red Bubble Pattern Address Labels from CheckAdvantage right now! Not a fan of this color? We also offer three other options as well as a set with all four shades.